Common Names: Galapagos bullhead shark, Galapagos horn shark, Peruvian horn shark. Identification: Grey/brown body with bold black spots. Spots roughly eye sized or smaller. Spots smaller and less distinct in juveniles. Large, blocky head. Dorsal fin spines short. First dorsal set relatively far back on body; origin level with trailing edge of pectoral fin. Pectoral fins large. Upper caudal lobe has rounded tip. Supraorbital crests (brow bones) relatively low. Jaw contains anterior, pointed, clutching teeth and rear molars. Habitat: Rocky and coral reefs. Rests on reef slopes, ledges and under overhangs on vertical walls at depths of 3 to 30m. Distribution: Eastern South Pacific. Galapagos Islands and Coastal Peru. Behavior: Described as nocturnal but seen by divers free swimming along reef slopes during the day. Diet: Known to feed on crustaceans. Reproduction: Oviparous. Lays distinctive auger shaped egg cases. 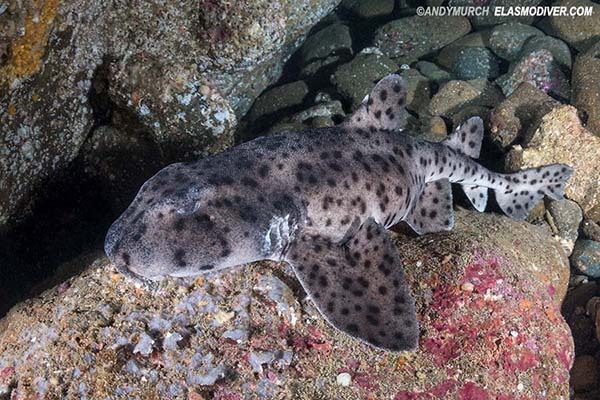 Conservation Status: Listed as DATA DEFICIENT by the IUCN but the Galapagos bullhead shark's limited range make it vulnerable. It is protected in the Galapagos Marine Reserve where it is not common and has an apparent limited distribution in suitable habitat (Rivera, unpublished data). While not presently fished in the Galapagos the apparent limited population size places this possible subpopulation of the species in a vulnerable position if it began to be captured here. This species is not of interest in commercial fisheries, but is presumably taken as bycatch by inshore fisheries elsewhere in its known range; however, little information is available. Research is required (taxonomy, ecology, bycatch, habitat) to accurately assess its conservation status. Photographs: Punta Vicente, west coast of Isabella Island, Galapagos Archipelago. Similar species: The Galapagos bull head shark's range may overlap with the Mexican bullhead shark - Heterodontus mexicanus. The latter species is known to occur at least as far south as Columbia and likely occurs in Ecuador and Peru. It can be distinguished by having fewer and larger spots, a more prominent brow and smaller dorsal fins. Reaction to divers: Easily approached. Remains motionless unless molested. 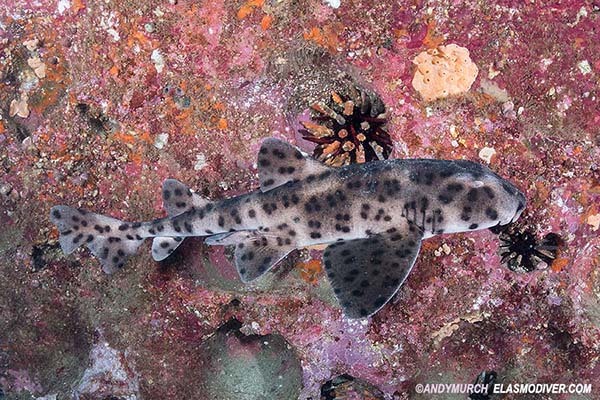 The Galapagos bullhead shark is a slow swimmer that can be followed and observed quite easily. Diving logistics: Most easily observed on the northwest corner of Isabella Island and around Fernandina Island; both in a remote region in the southwestern Galapagos. This area can only be accessed by liveaboard dive boat from San Cristobal. Numerous liveaboards operate in the Galapagos but pay attention to the itinerary as not all of them visit Fernandina. Big Fish Expeditions runs a bi-annual shark diving trip to the Galapagos that always includes this area as part of their itinerary. Kyne, P.M., Rivera, F. & Leandro, L. 2004. Heterodontus quoyi. The IUCN Red List of Threatened Species 2004:e.T44579A10907948. http://dx.doi.org/10.2305/IUCN.UK.2004.RLTS.T44579A10907948.en. Downloaded on 24 December 2017.